Symon Rental is a family owned business with a great deal of experience and a wide variety of rental equipment. We have been in business since 1988. The key to our longevity in the rental industry is our commitment to customer service and our experience. From intimate parties to large scale events, whatever the occasion a tent creates a festive atmosphere your guests will love. 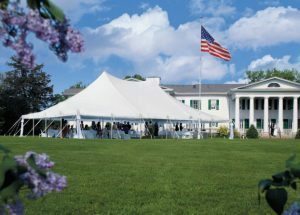 We have multiple tent sizes and styles that fit almost any space and can be installed on almost any surface. Whether you’re placing a tent in an open field, or over a tight restaurant patio let us help configure a solution that meets your needs. We offer a full line of stage and exhibit booth equipment for career fairs, trade shows, fashion shows, and bands. Our stages have had the President of the United States, cars, models, bands, and celebrities upon them. If you don’t see it on our website please ask, we may have a source for you. If you are planning a large or small, indoor or outdoor event, perhaps a graduation, birthday party, festival, fundraiser, wedding, or corporate event, please contact us at 734-283-5374. Delivery and pick-up rates are determined by size of order and distance.